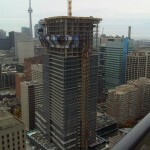 Currently under construction at the corner of Yonge and Gerrard, Canada’s tallest condo tower (when complete) looks set to open up it’s retail shops shortly even as construction continues. 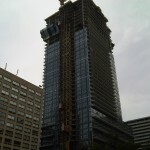 Developer Canderel Stoneridge, also responsible for the DNA Lofts, the Residences of College Park, and the Massey Harris Lofts, began construction on this 78 storey tower in 2010. 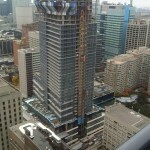 With a grand total of 985 suites, Aura will be an impressive landmark in Toronto’s downtown core. 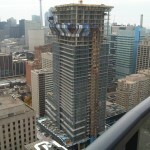 I just took these photos showing the construction progress from College Park, and a penthouse suite balcony in the Met, at Yonge and Carlton. The penthouses of Aura, between the 75th and 77th floors will range in size from 2200 to over 5000 sq ft, and priced from $2.2 million, to the top floor penthouse (11,370 sq ft) at $17.5 million. These suites will have panoramic sky high views of downtown Toronto and beyond. Aura will have direct underground access to the College Park Subway, a connection to the PATH system, walking distance to U of T and Ryerson, hospitals, the Financial District, designer shopping, restaurants and entertainment. The podium of the tower will feature 180,000 sq ft of retail space anchored by U.S. giant retailer Bed Bath & Beyond, establishing the retailer’s first urban location in Canada. Other retailers will include BMO, Alice Fazooli’s and Canyon Creek restaurants.